Buy Dear Zachary on DVD! Kurt Kuenne's acclaimed orchestral score for "Dear Zachary", nominated for Best Documentary Score of 2008 by the International Film Music Critics Association, is now available on CD and for digital download. The album includes "Andrew", the 8 minute concert work Kurt wrote and recorded in Andrew's memory in 2002. After four years of being out of print, David Bagby's book "Dance with the Devil" (Andrew Bagby's father's powerful memoir of the events depicted in "Dear Zachary") is finally available in paperback and e-book. Purchase the book here. On December 15, 2010, Governor General David Johnston gave Royal Assent to Bill C-464: An Act To Amend the Criminal Code (justification for detention in custody), making it law in Canada. The private member's bill was introduced by MP Scott Andrews of Newfoundland last fall after he saw "Dear Zachary" at a March 2009 screening in Ottawa and decided to do something about what he saw. The bill has added an amendment to Canada's criminal code giving courts the right to refuse bail to someone charged with a serious crime who is deemed a potential danger to children under the age of 18. Bill C-464 was introduced in the House of Commons on October 22, 2009, passed the House of Commons unanimously on March 22nd of this year and passed the Senate of Canada last Thursday, December 9th, where it was sponsored by Senator Tommy Banks of Alberta. This marks the first time in history an MP from Newfoundland has been able to get a private member's bill through Parliament; since 2001, 2,510 Private Member's Bills have been introduced in the House of Commons, but only 23 - less than 1% - have received Royal Assent. I extend my deepest thanks and greatest respect to MP Scott Andrews, his associate Ken Carter, Senator Tommy Banks, his executive assistant Thérèse Gauthier, MP Peter Stoffer, Senator Anne Cools, Gord McIntosh and everyone in Parliament who saw across party lines to support this bill's passage into law. Amending Canada's bail code was my goal in releasing "Dear Zachary" publicly; it is my pleasure to announce that goal is now a reality. On Monday, March 22, 2010, the House of Commons in Ottawa unanimously passed Bill C-464 - An Act to Amend the Criminal Code (justification for detention in custody). The private member's bill was introduced by MP Scott Andrews of Newfoundland last fall after he saw "Dear Zachary" at a March 2009 screening in Ottawa and decided to do something about what he saw. The bill now moves to the Senate where it is expected to be embraced in a similar fashion. Senator Tommy Banks of Alberta will be the bill's sponsor in the Senate, and will shortly be distributing DVDs of "Dear Zachary" to all members of the Senate, just as he and MP Andrews distributed the film to all members of the House of Commons last fall when he introduced the bill. The bill, if passed into law later this year, would justify detention in custody for those accused of a serious crime who are a potential danger to their own children under the age of 18. Kate and David Bagby traveled to Ottawa last week to speak as witnesses for the bill before the House's Standing Committee on Justice & Human Rights. The committee passed the bill unanimously, which is how it came to be heard in the House for a final vote this week. Please check back for updates as the bill makes its way through the Senate in the coming weeks -- and if you are a Canadian Citizen, please write your Senator to voice your support of C-464 during this crucial time. Click HERE for assistance. We send a huge thanks to MP Scott Andrews, his assistant Ken Carter, MP Peter Stoffer, Senator Tommy Banks, his assistant Thérèse Gauthier, Gord McIntosh and all those in Parliament who have seen across party lines and supported this bill to honor Andrew & Zachary and help prevent a recurrence of our story. On December 4, 2009, Bill C-464 (our bail reform bill) was discussed on the floor of the House of Commons for a full hour, and MP Scott Andrews received unanimous support from all political parties in the House of Commons to advance the bill to the Standing Committee on Justice & Human Rights. Kate & David Bagby will now be called as witnesses before the committee, the bill will be revised and strengthened, and eventually brought back into the House and Senate for a vote. This is a huge step forward in the mission Dear Zachary was created to accomplish. MP Andrews was inspired to create Bill C-464 after seeing Dear Zachary for the first time in March; he and Senator Tommy Banks distributed DVDs of Dear Zachary to every member of the House of Commons for their review immediately following the December 4th discussion. Bill C-464 when enacted will justify detention in custody for a person accused of a serious crime who is a potential danger to their own minor children. We urge you to write your MP (if you're Canadian) or the Attorney General of Canada (if you're not) in support of MP Andrews' bill; the next few months are a crucial time. Information on who and where to write can be found on the "Support Bail Reform" page. An abridged version of "Dear Zachary" will premiere on CBC Newsworld in Canada on Sunday, October 25th at 10 PM ET/PT. Check your local listings for channel info. This abridged version was prepared personally by Kurt Kuenne in order to comply with CBC Newsworld's time constraints but preserve the film's impact while reaching a wider audience in Canada. Kurt is incredibly grateful for the good folks at MSNBC for making this arrangement happen. Also, today MP Scott Andrews of Newfoundland introduced a bill in Parliament for its first reading that proposes a modification to Canada's bail code that would justify detention in custody for a suspect who is a potential danger to their own minor children. The bill is called C-464 - An Act to amend the Criminal Code (justification for detention in custody). MP Andrews was spurred on to the creation of this bill after seeing "Dear Zachary" at a March screening in Ottawa to which all Members of Parliament were invited. We're thrilled with MP Andrews' initiative and efforts, and support him 100% as he moves this bill forward. We urge everyone to write your MP (if Canadian) or the Attorney General of Canada (if not) urging them to support MP Andrews and his bill as it moves toward a vote in the near future. Information on who and where to write can be found by going to the "Support Bail Reform" page. Dear Zachary recently won the Sigma Delta Chi Award for Best Documentary of 2008 from the Society of Professional Journalists. It also took 3rd place in the National Headliner Awards for Best Documentary of 2008, given by the Press Club of Atlantic City. 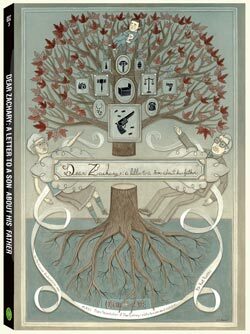 Also, by popular demand, a new printing of David Bagby's book "Dance with the Devil: A Memoir of Murder and Loss" featuring Dear Zachary's poster art on its cover is now in stores. Lastly, Dear Zachary was screened in Ottawa on March 11, 2009 for various members of Parliament and their staff; as a result, a small but committed group of Parliamentarians are now drafting a bill based on the issues raised in the film. We'll keep this website updated as to their progress when there is news. Dear Zachary is now available on DVD! In January, the film was nominated for Best Documentary by both the Chicago Film Critics Association and the Online Film Critics Society, who also nominated writer/director/composer Kurt Kuenne for Breakthrough Filmmaker of 2008. The International Film Music Critics also nominated his musical score for Best Documentary Score of 2008. Dear Zachary was named one of the top 5 documentaries of 2008 by the National Board of Review! It also recently won Best Documentary at the Orlando Film Festival and the Audience Award at the St. Louis International Film Festival. Dear Zachary recently won the Audience Award at the Sidewalk Moving Picture Festival in Birmingham, Alabama! It also recently screened at the Calgary International Film Festival and the Edmonton International Film Festival to standing ovations from Canadian audiences, where it inspired many audience members to write their Parliament in support of bail reform. Dear Zachary has been acquired for theatrical release and DVD distribution by the newly formed Oscilloscope Pictures, and will be released in New York on October 31st, and in Los Angeles and Chicago on November 7th. See details above! Screening next at DocuWeek, the International Documentary Association's Theatrical Documentary Showcase. In New York - August 8-14 at the IFC Center, 323 Sixth Avenue at W. 3rd Street. Click HERE for ticket information. In Los Angeles - August 22-28 at the Arclight Hollywood, 6360 Sunset Blvd. Click HERE for ticket information. Read the DocuWeek Q&A with writer/director/composer Kurt Kuenne HERE. Dear Zachary has been announced as the first film to launch the newly formed MSNBC Films division of MSNBC. It will have its television premiere on MSNBC this fall following a theatrical release that is currently in negotiations and expected to be announced in the coming weeks. Dear Zachary was also a hit at Silverdocs, the AFI/Discovery Channel Documentary Film Festival over the weekend of June 21st & 22nd, where both screenings were once again met with standing ovations; Silverdocs nominated Dear Zachary for its inaugural Writers Guild of America Documentary Screenplay Award. Dear Zachary had its Canadian premiere at the Hot Docs International Documentary Film Festival in Toronto, where it was welcomed by a line down the street and around the block to get in. Both screenings received sustained standing ovations, and the Toronto audience applauded yet again when director Kurt Kuenne announced that he had sent letters to every member of Parliament requesting the opportunity to screen the film for them. Dear Zachary was then voted the #3 audience favorite of the festival by viewer ballot, out of the 172 distinguished documentaries screening at Hot Docs. Dear Zachary was the most honored film at Cinequest 18 in San Jose, receiving sustained standing ovations from packed houses at all 3 screenings and winning 2 awards - a Special Jury Award for Documentary Feature and the Audience Award. It then played SXSW in Austin, Texas, where it left audiences stunned and in tears. Dear Zachary was a hit at Slamdance! Both screenings were sold out and received sustained standing ovations, an exceptionally rare event in the 14 year history of Slamdance. Slamdance Film Festival book signing! David Bagby will be signing copies of Dance with the Devil on Sunday, January 20th, from 3-4 P.M. at Dolly's Bookstore, 510 Main Street, Park City, Utah. Dear Zachary will have its World Premiere at the Slamdance Film Festival, January 17-25, 2008 in Park City, Utah! Click here for ticket information!